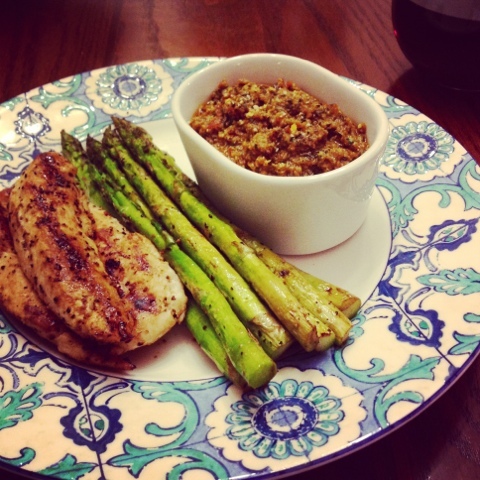 Tonight we're making our lemon grilled chicken with a sun-dried tomato & basil dipping sauce. The sauce is deliciously thick and flavorful made with sun-dried tomatoes, fresh basil, garlic, lemon juice, Parmesan cheese and a touch of extra virgin olive oil to create a creamy, thick texture. This is so good we could eat it by the spoonful! We served this up with a side of grilled asparagus (which we also dipped!) for the perfect easy & delicious weekday dinner. 1. To make your sauce, add sun-dried tomatoes, basil, garlic, Parmesan cheese, olive oil and juice of 1 lemon to the food processor and blend to combine. Refrigerate when blended. 2. Season up the chicken with 1/2 the garlic powder, juice of half a lemon, salt and pepper. 3. Heat grill pan over medium high heat and grill chicken until cooked through. About 10 minutes flipping halfway through. 4. Season asparagus with remaining garlic powder, juice of half a lemon, salt & pepper and grill under tender crisp - about 5-6 minutes.